The history of Digoin is written in its stoneware — hard but mutable, able to withstand pressure but vulnerable to breakage. Where 40 ceramics manufacturers using the unique sandstone paste of the Loire once occupied Burgundy’s so-called “Ceramics Valley,” today only a few remain. And perhaps only one of them — Manufacture de Digoin — is experiencing a robust revival. Until recently, Manufacture de Digoin was no different than the other failing foundries of the Loire, producing as they did such quaint artifacts of the Victorian era as stoneware pipes and planters. Founded in 1875, at its height the factory employed over 200 people producing stoneware pots and jugs, cooking vessels, and horticultural objects. At one point not too long ago, the factory was most famous for cups that held a popular type of Roquefort cream. And then, in the 1980s, came the rise of the French super market. The widespread use of plastic packaging. The primacy of the Chinese. Suddenly, not only was packing food in hand-made stoneware pots excessively expensive but it was unfashionable. Production dwindled. Staff numbers went down. Factories closed. For its part, Manufacture de Digoin held on longer than most, going into bankruptcy first in 2002 before being rescued a year later and reopening with just 10 skilled workers. It failed again in 2014, closing its doors in May. But it found an unusual savior this time in the guise of indefatigable former marketing executive Corinne Jourdain Gros. Working toward a mid-career MBA, Corinne wrote her dissertation on the traditions of French manufacturing, stoking a fascination with companies that exemplify centuries of Gallic culture. Companies like Digoin. Upon learning of its second bankruptcy, she quickly gathered a cadre of investors to purchase it and, by September of 2014, Manufacture de Digoin was again open. Hiring back the 10 workers who had been laid off before, Corinne has set about to honor Digoin’s history while making it viable for the modern world. 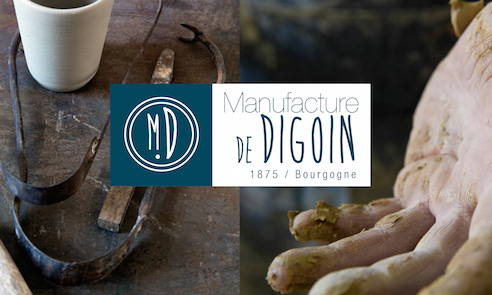 While the Maille mustard company does package its Dijon in Digoin’s stoneware, the factory can no longer rely on food production work. Rather, it needs to invite and inspire a new generation of those like Corinne, who understand the narrative imbued in the products and are anxious to experience some of that for themselves. Because Digoin can rely on its history, its artistry, its sense of beauty, and the fresh air of change. Under Corinne’s eye, this venerable brand continues to offer the cookware that is found in well-stocked French kitchens for decades, but now with fresh new glazes and some new forms. The resulting stoneware is gorgeous to look at and hold and makes a wonderful addition to any kitchen. Use the Digoin to bake and roast, store homemade vinegar, set to table, contain terrines, and much more. Made by hand, each piece is unique. Fired at extremely hot temperatures, Digoin glazes are fixed to a unique shine and the ceramics themselves are airtight, which is ideal for baking and roasting. Digoin is exactly the type of product that SHED exists to purvey and promote. It has a history, a wonderful story, and is meaningful beyond its mere products. Are you ready to begin your collection? This entry was posted in Meet the Makers and tagged Manufacture de Digoin. Over the Christmas holiday our digoin nesting bowls were destroyed from a fall. I searched for days trying to find this product. You can imagine my surprise when I came across The Shed… I’m so excited about you store and the fact you carry digoin grespot…. I placed my first order this week with the help of a wonderful young man I’m sad I cannot remember his name. I plan on making many future orders. Very happy to own one of these beautiful treasures, and so glad that the Shed carries them. Bravo!